Our highly skilled, Ford trained service team will ensure your Ford is in tip top condition and safe to drive. We use Ford parts and accessories to ensure the maintenance is kept at a high standard and the value of your vehicle stays the same. With competitive prices and transparent work, you can put your trust in Ford to deliver the best and most cost effective service. When your Ford is in need of a repair our Ford Dealers offer an excellent service. All of our technicians have completed training by Ford to provide a quality service with quality results. Ford original parts are always available and all repairs come with warranty. We offer the best service solution for all vehicles, no matter its age and if required we will deal with your insurance company. Plus, your Ford perforation warranty will remain valid for the whole vehicle. Just as high quality as our cars, our replacement parts are made to the same high standards. When you choose ford original parts you will be choosing the highest performance, durability and safety for your Ford. Using Ford original parts will maintain the value of your car and as a result you can get more for your Ford when you choose to upgrade to another. Our Ford Original Part can be easily recognised by the trademark often displayed in a prominent position of the product. Safety is most important, and your Ford will provide excellent pedestrian and passenger safety. The Motor Industry Research Association (MIRA) conducted independent tests which has shown the risk of injury to a pedestrian collision is up to 17% greater with a tested copy bonnet. To keep your Ford in tip top condition you should service your Ford every year or when it reaches its recommended mileage. To help prevent minor problems turning into expensive and major ones you can maintain your Ford on a regular basis, even outside of the scheduled intervals. A detailed explanation of the invoice and services which are completed and an exact agreed price. Ford dealers will also walk around your car and look at the work has been down as confirmation. 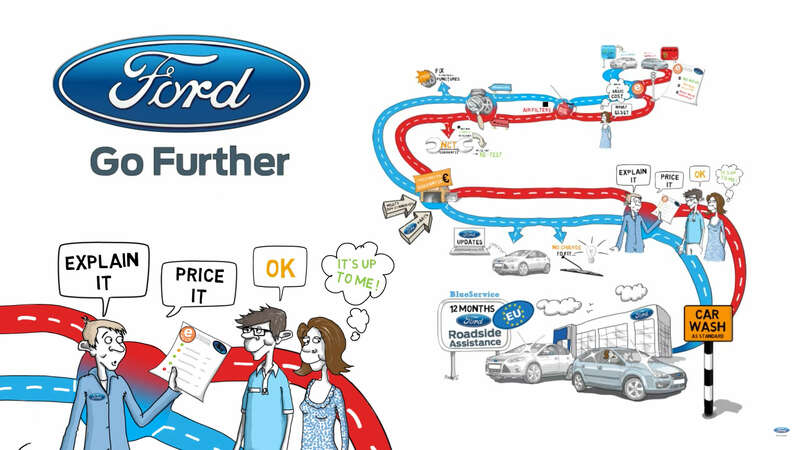 At Ford you will be enrolled for FREE European Roadside Assistance with every routine service. Every time you bring in your Ford for a routine service at a Ford dealership, you will automatically receive a 12 month roadside assistance through-out Europe completely FREE. Not only is servicing good for your Ford, but it’s also good for your peace of mind! You can contact your local Ford Dealer to the Customer Relationship Centre who will help you with any recall information, but if you are in the unlikely event of a safety recall we will send you a letter to the registered owner informing you that the work needs to be completed as quickly as is convenient for your lifestyle. When a company vehicle needs work done, we know how important it is to get a reliable service. Through-out our Ford dealerships, we have a network of commercial vehicle specialists who have full commitment to delivering a reliable service. This helps towards minimising downtime and reducing fleet running costs. In an emergency, our commercial vehicle specialists will carry out an on-the-spot inspection to speed up diagnosis and repair and to get you back on the road as soon as possible. Most of our specialists also offer a while-you-wait service by prior appointment. In most instances, your Ford commercial vehicle specialists will provide you with a replacement vehicles if repairs cannot be completed within the specified time period. Our specialists hold a range of Ford original parts available to order and use with same day or overnight express delivery from Ford when required. Our technicians know the Ford commercial range inside out. They are specially trained by Ford to meet rigorous technical standards as well as customer service standards. If you are in the unlikely event that your vehicle encounters a problem, our commercial vehicle specialists are on head 24/7, and all year round, they are here to ensure you get moving again. When choosing a commercial vehicle, cost of ownership is an important factor. You’ll be glad to hear that Ford have an outstanding reputation for durability and low running costs. The new Transit range has service intervals extended to 50,000km, lower emissions, cost effective maintenance, excellent fuel economy and a variety of warranty packages. For further information please get in touch with a member of our team.